Early repair has evolved as the mainstay of treatment for flexor tendon lacerations. In the setting of a failed early repair or conditions in which early repair is not feasible, a delayed reconstruction remains a viable option to restore function to the affected digit. Roughly half of all flexor tendon injuries occur in zone II. The sheath commences at the palmar plate of the metacarpophalangeal (MCP) joint with the A1 pulley. A condensation of the palmar aponeurosis (PA) results in the so-called PA pulley. Where the tendon overlies a joint, the sheath should be sufficiently thin and resilient, resulting in the cruciate (or retinacular) intervals. 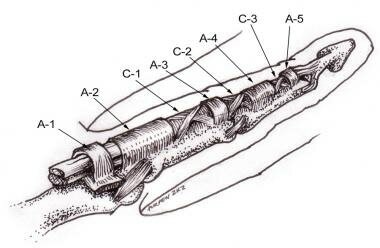 Where the flexor sheath overlies the phalanges, it is tough and unyielding (annular pulleys A2 and A4). Retinacular portion of the flexor tendon sheath. In the thumb, A1 and A2 pulleys are over the palmar plates, and an oblique pulley is over the proximal phalanx. This passes from proximal ulnar to distal radial; in so doing, it is virtually an extension of the adductor, which inserts into the sesamoids. The sesamoids, into which insert the two heads of the flexor pollicis brevis (FPB), lie within the substance of the palmar plate. In the thumb, similar to the A2 and A4 pulleys in the fingers, the oblique pulley is sacrosanct. Because of the obliquity of the oblique ligament and ulnar takeoff, the A1 pulley in the thumb is best divided radially. This is important when surgical release of a trigger thumb is performed. No pulley should be incised during the course of tendon repair, with exception of the A1, A3, and A5 pulleys. Repair is impossible because of the snug fit and the transverse orientation of the fibers. The issue of sheath reconstruction is controversial, and the decision to undertake this is best individualized after thorough assessment of the patient. The sources of fascia include the adjacent fingers, the dorsal wrist retinaculum, and the foot. For pulley reconstruction, place the tendon graft around the phalanx (sutured to itself), either beneath the extensor tendon for the A2 pulley or superficial to it for A4 pulley reconstruction. A transverse strip of dorsal wrist retinaculum is harvested via a longitudinal incision. If a Hunter rod reconstruction is being performed, it is often useful to reconstruct the pulley first before placing the rod so as to achieve sufficient tension on the pulley. After the graft has been sutured, it is rotated around so that a synovial surface overlies the tendon. Such grafts have been demonstrated to continue secreting synovial fluid. For more information, see Flexor Tendon Anatomy. Diffusion takes place via the synovial lining sheath. Canaliculi pass through the tendon to the surface of the tendon. Movement of fluid into these canaliculi has been demonstrated. This effect is enhanced with digital motion. Perfusion is accomplished via the segmental arterial supply. The blood supply to the tendon enters distally via the bony insertion and proximally via the vincula. Four vincula, designated V1 to V4, are present. V1 and V2 supply the flexor digitorum superficialis (FDS), and V3 and V4 supply the flexor digitorum profundus (FDP). They arise at the necks of the proximal and distal phalanges, respectively. In the thumb, the vincula likewise are termed V1 and V2. No flow occurs between adjacent territories of vincula. Presumably, this area is sustained by diffusion through the synovial fluid. The vascular plexus within the tendon occupies the dorsal half. This is important at the time of placement of core sutures during flexor tendon repair. Logically, diffusion occurs in areas of the tendon that are compressed in flexion, while the other areas are perfused. The FDP is more dependent on diffusion than the FDS is. Modern thinking is that tendon healing is initiated by the proliferation of epitendinous cells, which migrate into the defect, forming a "callus" equivalent. Somewhat later, the tenocytes or fibroblasts from within the tendon invade the callus, producing further collagen that realigns to produce the strong tendon. Peritendinous adhesions are not necessary for either healing or nutrition. In the Littler method, each joint's individual range of motion (ROM) is measured. The Boyes technique uses the pulp-to-midpalmar crease measurement (nail-to-table measurement can be added). The TAM method incorporates the summed ROM of the interphalangeal (IP) joints minus the extension deficit, as a fraction of 175. [5, 6] Some incorporate MCP measurement. Strickland reported 50% of repairs achieved 50% of TAM. He reported 80% improvement following tenolysis, with 3% rate of rupture. Lister reported 71% improvement but with 21% rupture. Both the Lister technique and the Buck-Gramcko technique incorporate the TAM (with MCP) and the distance from pulp to midpalmar crease. These are used widely. Lister reported 80% good or excellent results in zone II with 85% outside of zone II. The FDS was excised in only 25% of patients with zone II injuries, and only 45% of those 25% achieved good or excellent results. This result is difficult to explain, but it may reflect improved blood supply or greater strength with the intact FDS. Only 12% of patients required tenolysis. Singer and Maloon reported 80% excellent or good results. Edsfeldt et al investigated the effect of concomitant nerve transection, combined FDP-FDS tendon transection, and patient age on digital ROM in 273 patients (311 fingers) more than 1 year after FDP tendon transection and repair in zone I and II. They found that age greater than 50 years was significantly associated with impaired digital ROM during the first year but not at 2 years. Concomitant nerve transection and combined transection of FDP and FDS were not found to affect digital mobility. Klifto CS, Capo JT, Sapienza A, Yang SS, Paksima N. Flexor Tendon Injuries. J Am Acad Orthop Surg. 2018 Jan 15. 26 (2):e26-e35. [Medline]. Freilich AM, Chhabra AB. 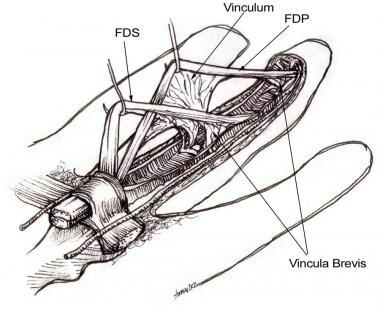 Secondary flexor tendon reconstruction, a review. J Hand Surg Am. 2007 Nov. 32 (9):1436-42. [Medline]. Docheva D, Müller SA, Majewski M, Evans CH. Biologics for tendon repair. Adv Drug Deliv Rev. 2015 Apr. 84:222-39. [Medline]. Long C, Wang Z, Legrand A, Chattopadhyay A, Chang J, Fox PM. Tendon Tissue Engineering: Mechanism and Effects of Human Tenocyte Coculture With Adipose-Derived Stem Cells. J Hand Surg Am. 2018 Feb. 43 (2):183.e1-183.e9. [Medline]. Strickland JW. Flexor Tendon Injuries: I. Foundations of Treatment. J Am Acad Orthop Surg. 1995 Jan. 3 (1):44-54. [Medline]. Strickland JW. Flexor Tendon Injuries: II. Operative Technique. J Am Acad Orthop Surg. 1995 Jan. 3 (1):55-62. [Medline]. Yildirim A, Nas K. Evaluation of postoperative early mobilization in patients with repaired flexor tendons of the wrist, the spaghetti wrist. J Back Musculoskelet Rehabil. 2010. 23 (4):193-200. [Medline]. Rigo IZ, Røkkum M. Predictors of outcome after primary flexor tendon repair in zone 1, 2 and 3. J Hand Surg Eur Vol. 2016 Oct. 41 (8):793-801. [Medline]. Edsfeldt S, Eklund M, Wiig M. Prognostic factors for digital range of motion after intrasynovial flexor tendon injury and repair: Long-term follow-up on 273 patients treated with active extension-passive flexion with rubber bands. J Hand Ther. 2018 Jul 5. [Medline]. Nassab R, Kok K, Constantinides J, Rajaratnam V. The diagnostic accuracy of clinical examination in hand lacerations. Int J Surg. 2007 Apr. 5 (2):105-8. [Medline]. Lalonde DH. An evidence-based approach to flexor tendon laceration repair. Plast Reconstr Surg. 2011 Feb. 127 (2):885-90. [Medline]. Wu TS, Roque PJ, Green J, Drachman D, Khor KN, Rosenberg M, et al. Bedside ultrasound evaluation of tendon injuries. Am J Emerg Med. 2012 Oct. 30 (8):1617-21. [Medline]. Hardwicke JT, Tan JJ, Foster MA, Titley OG. A systematic review of 2-strand versus multistrand core suture techniques and functional outcome after digital flexor tendon repair. J Hand Surg Am. 2014 Apr. 39 (4):686-695.e2. [Medline]. Strick MJ, Filan SL, Hile M, McKenzie C, Walsh WR, Tonkin MA. Adhesion formation after flexor tendon repair: comparison of two- and four-strand repair without epitendinous suture. Hand Surg. 2005. 10 (2-3):193-7. [Medline]. Al-Qattan MM, Al-Turaiki TM. Flexor tendon repair in zone 2 using a six-strand 'figure of eight' suture. J Hand Surg Eur Vol. 2009 Jun. 34 (3):322-8. [Medline]. Al-Qattan MM. Finger zone II flexor tendon repair in children (5-10 years of age) using three 'figure of eight' sutures followed by immediate active mobilization. J Hand Surg Eur Vol. 2011 May. 36 (4):291-6. [Medline]. Giesen T, Reissner L, Besmens I, Politikou O, Calcagni M. Flexor tendon repair in the hand with the M-Tang technique (without peripheral sutures), pulley division, and early active motion. J Hand Surg Eur Vol. 2018 Jun. 43 (5):474-479. [Medline]. Xie RG, Zhang S, Tang JB, Chen F. Biomechanical studies of 3 different 6-strand flexor tendon repair techniques. J Hand Surg Am. 2002 Jul. 27 (4):621-7. [Medline]. Su BW, Solomons M, Barrow A, Senoge ME, Gilberti M, Lubbers L, et al. A device for zone-II flexor tendon repair. Surgical technique. J Bone Joint Surg Am. 2006 Mar. 88 Suppl 1 Pt 1:37-49. [Medline]. Hwang MD, Pettrone S, Trumble TE. Work of flexion related to different suture materials after flexor digitorum profundus and flexor digitorum superficialis tendon repair in zone II: a biomechanical study. J Hand Surg Am. 2009 Apr. 34 (4):700-4. [Medline]. Manske PR. History of flexor tendon repair. Hand Clin. 2005 May. 21 (2):123-7. [Medline]. Pillukat T, Fuhrmann R, Windolf J, van Schoonhoven J. [Tenolysis of the flexor tendons in the hand]. Orthopade. 2015 Oct. 44 (10):767-76. [Medline]. Sasaki J, Itsubo T, Nakamura K, Hayashi M, Uchiyama S, Kato H. Intrasynovial tendon graft for chronic flexor tendon laceration of the finger: a case report. Open Orthop J. 2013. 7:282-5. [Medline]. [Full Text]. Chow JA, Thomes LJ, Dovelle S, Monsivais J, Milnor WH, Jackson JP. Controlled motion rehabilitation after flexor tendon repair and grafting. A multi-centre study. J Bone Joint Surg Br. 1988 Aug. 70 (4):591-5. [Medline]. Vucekovich K, Gallardo G, Fiala K. Rehabilitation after flexor tendon repair, reconstruction, and tenolysis. Hand Clin. 2005 May. 21 (2):257-65. [Medline]. Dy CJ, Hernandez-Soria A, Ma Y, Roberts TR, Daluiski A. Complications after flexor tendon repair: a systematic review and meta-analysis. J Hand Surg Am. 2012 Mar. 37 (3):543-551.e1. [Medline]. Two-strand repair techniques. (A) Tsuge, (B) modified grasping Kessler, (C) modified locking Kessler (ie, Pennington modified Kessler), (D) modified Pennington. Multistrand core suture techniques performed with single-stranded suture. (A) double modified locking Kessler, (B) cruciate nonlocked, (C) cruciate cross-stitch locked, (D) 4-strand Savage, (E) augmented Becker (also called as MGH repair), (F) 6-strand Savage, (G) modified Savage, (H) triple modified Kessler. Epitendinous suture techniques. (A) cross-stitch, (B) Lin, (C) Halsted, (D) horizontal intrafiber, (E) simple running, (F) Simple running superficial and simple running deep. The authors and editors of Medscape Drugs & Diseases gratefully acknowledge the contributions of previous author D Glynn Bolitho, MD, PhD, FACS, FRCSC, FCS(SA), to the development and writing of this article.